In one of my Interweave classes, the presenter came to a point where she said we viewers would be saying OMG! Paula what are you doing? That’s a hot mess! and her advice was that you need to be prepared to work thru the uglies. I get that. 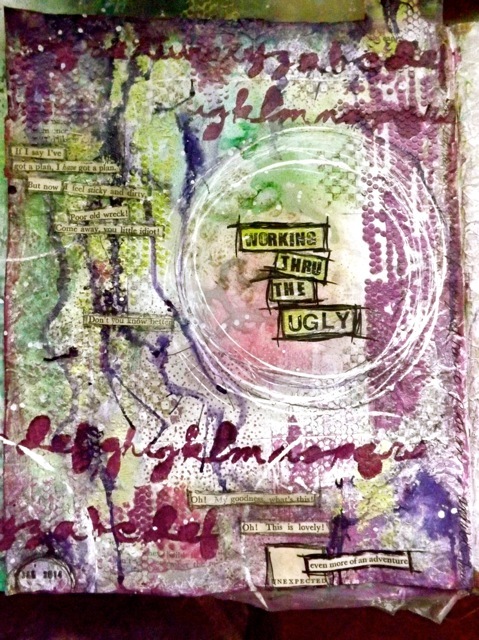 That is one of two problems I have already identified while I am exploring and playing with the whole art journal lark. The other is the whole knowing when to stop/knowing when NOT to stop. I get to a point, I like where a page is, and then I carry one to the ugly – usually I move past that (ok, yes, in the all of 4 or so pages I’ve done, clearly I have a WORLD of experience behind me….NOT) to something I like again, but sometimes I do think longingly of that perfect point where I liked it a lot and wished I had stopped. 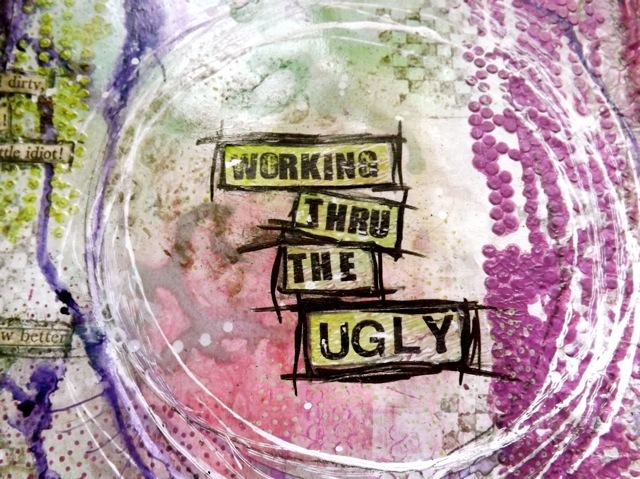 This page has two meanings – the journaling, which is just down along the right side, simply says In art, like life, sometimes you just have to work thru it…. So true. I don’t usually bother to take staged photos of a page – first because it seems to break my flow if I’m constantly grabbing for the camera, but more importantly I don’t view myself as any sort of talent or expert and feel I don’t really have much to add to all the really talented folk out there already doing detailed step-by-steps for people like me to learn from. But I will note a couple of things. 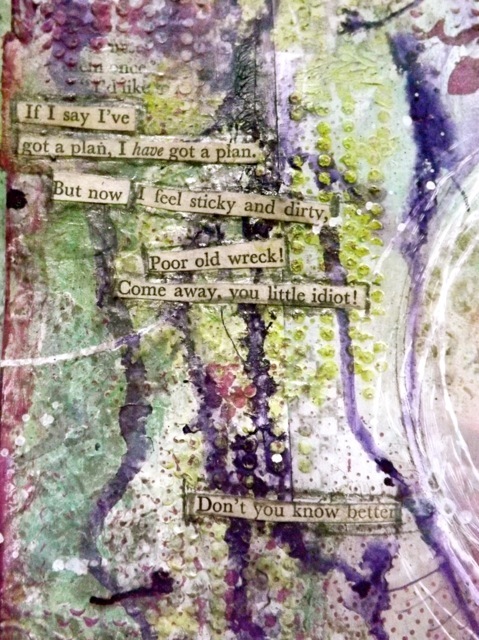 The larger words are stamped on a scrap of my palette paper – I felt that was a nice way to get the same colours without any additional effort. They tiny book text is cut from a Famous Five book – this is a problem for me. I’ve never READ the Famous Five, not growing up in the UK. I was very much a Nancy Drew kinda gal. But as I looked thru the old book, I kept getting sucked in to the story. I should have read it before I cut out the first few words. LOL! The text is a little stilted, making the best of what was available, rather than finding the perfect words, but I think it gets the point across in a quirky sort of way…. I also discovered on major issue with using the highly crumpled and textured paper bags as a base. They are fairly flimsy but even gessoed it is mighty hard to lay on a stencil and be able to press it flat to the ridged surface and get a clean modelling paste detail. You can see it here best – the stencil just can’t make smooth and tight contact with the background enough to keep the paste from squidging under it. I guess I can live with it. I rather like the perhaps unusual colour combos on this page. I’d use it again…it’s a struggle to keep myself from lapsing into tonal/ombre/expected colour combos and just thinking PURPLE, LIME and MINT with a touch of magenta, to myself makes me go YUCK! but I actually love it. I DO have something I am dying to try but need to wait for a delivery first. Fingers crossed it’ll be tomorrow. If it works like I hope it will I’ll take the time to show more detail, I promise. Categories: art journal, Uncategorized | Tags: art journal | Permalink. 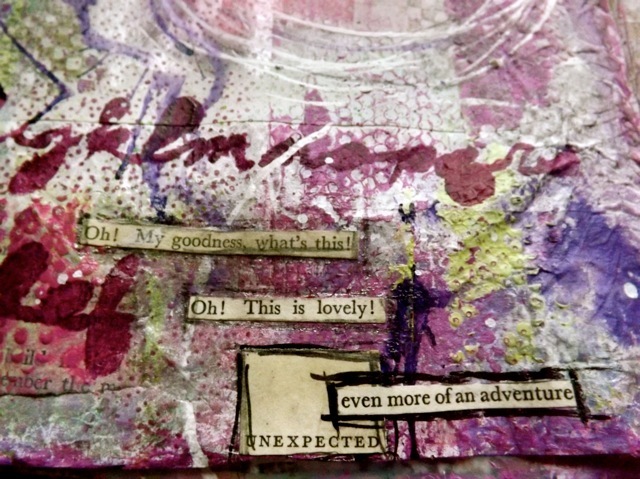 I’ve enjoyed seeing your art journal coming together. It’s inspired me to put one together. At least begin! I like that you are showing the good, bad, and ugly. I’m almost ready to start putting the signatures together. Maybe I’ll get that done tonight. 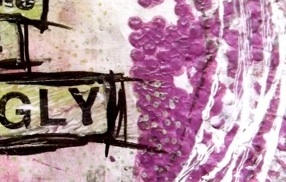 My stack of gelli prints is getting ‘fatter’ and I need to put some to use! Thanks! I admit if you hadn’t told that you used a stencil, I would not have guessed. I’m sure when you work with as many layers as you do, it’s like organizing. I tell people it always looks the worst right before it all comes together. Guess you can say the same for art, too. Do read a famous five and/or a secret seven. I absolutely loved them as a child. I’ve seen that guy before! I don’t think it was this particular technique but the artist’s photo is so familiar. I love the idea! Can’t think where it was but I also saw someone who just circled words on the page, always in a vertical “line,” and linked them along a path to create the poem. , but the black out version is more dramatic. Thanks for sharing the link!